During the construction of Drakelow Tunnels several tragic accidents occured, resulting in the death's of six men and one woman. The first and most traumatic series of deaths occured on the 31st October 1941, as a roof collapsed in Tunnel 1, this is documented in Rover's archives. Whilst blasting in Tunnel 1, the roof suddenly caved in without warning, Mr Harry Depper and two of his collegues who were working in the tunnel were crushed to death by the falling rock. Mr Depper was buried in a local cemetery on the 5th November 1941, sadly the names of his two collegues are not known. The fourth death at Drakelow was that of Mrs Mary Ann Brettel, who was accidently hit by one John Cochrane & Sons dump trucks whilst outside the complex, she later died of shock. The last three death's at Drakelow were unfortunatley down to sheer bad luck. To make excavation of the tunnels more effective, conveyor belts were installed to remove the loose rock caused by blasting. After a hard day of working the tunnels, two of the construction workers decided to ride on top of the conveyor, before they reached the end they became entangled in the machinery which mangled them to death. The last known death to occur at Drakelow was that of Mr.Eric Harold Newman, Mr. Newman was the Security Officer for Goods In & Out. Whilst leaving the complex one evening on his motorbike, he was accidently struck down by Mr. Wilkes, the coach driver who used to bring in the workers each day to Drakelow. Since 1993, when Drakelow was decommissioned and sold by the Ministry of Defence, the current owners and visitors alike, have been witness to several unexplained occurences within the complex. As with most MoD disposals, the history and what went on at their sites remain classified or is still under the Official Secrets Act. When Drakelow was disposed off, no history of the complex was given to the current owners, it is only through research and former people who worked in the complex coming forward that information has come to light, although there are still huge gaps in its history. Whether or not the MoD experienced strange events at Drakelow is unkown, and even it they did? they would never disclose it. One evening in late 1993, the caretaker was inspecting the kitchen in the old RSG side of the complex when he began to hear faint 1940's music, it seemed to be coming from the old Rover Shadow Factory side, thinking it may possibly be a maintenance engineer who had left his radio on he went to investigate. As he approached Tunnel 1, the music began to get louder, as he stepped out into Tunnel 1, the music suddenly stopped. He walked the length of Tunnel 1 to see if he could find the radio, but nothing was found. Upon reaching the old time offce at the end of Tunnel 1 the music started again, the caretaker walked back down the tunnel only to find nothing again. The caretaker now determined to find the mysterious radio, continued his search, this quick inspection then turned into a 6 hour search of the entire complex, but no radio was found. The only piece of equipment that was capable of playing music, was the old WWII tannoy system that had not worked since the 1950's. Another strange event occured late one evening in the winter of 1996, whilst on his usual rounds, the resident caretaker and his two german shepards were locking the complex down after a work party had been in during the day repairing some elctrical wiring, all was as usual, until they reached the RGHQ. The caretaker was securing the GPO Telephone exchange whilst his dogs wandered into the next room. Suddenly the dogs began barking frantically as if an intruder had been discovered, the caretaker quickly rushed in to see what was happening, to his surprise there was no one to be seen? The dogs were sat fixated on the wall still barking manically, the caretaker eventually calmed the dogs down and put them back on their leads, and continued with his round. As they stepped into Tunnel 4, the dogs stopped dead in their tracks and began growling, the cartaker bent down in an attempt to calm the dogs once more but this time to no avail, they ignored him completely, they stood transfixed on something at the top of the tunnel, following their gaze the caretaker focused on what the dogs were looking at, but could not see anything?. As he stood back up the dogs fell silent, the caretaker glanced up and couldnt believe his eyes, a mist was now present at the top of Tunnel 4 and was slowly floating down the tunnel. At this point the dogs broke free and fled back through the RGHQ, the caretaker quickly followed the dogs thinking there may be a fire outside of Tunnel 4, when he finally caught up with the dogs, they were barking and desperatley scratching the Blast Door at Adit "A". He opened the Blast Doors and the dogs ran to his car outside, locking the door, the cartaker then jumped in his car and sped round to the Entrance of Tunnel 4, to see how bad the fire was. When he arrived a few minutes later, he could not believe what he saw...Nothing! No fire and no mist? Confused, he drove back round to Adit "A", he got out of the car and beckoned the dogs but they refused to move from the car. The caretaker re-opened the Blast Doors and made his way back to Tunnel 4, expecting the worst he took a fire extinguisher with him but as he stepped out into Tunnel 4 nothing was to be seen, no fire no mist, nothing, just and empty tunnel. The caretaker returned with his dogs a few days later but as soon as they approached the entrance they began whimpering and refused to enter the complex. Over the years many visitors to Drakelow have also experienced unexplained events, the feeling of being constanly watched, sudden drops in temperature, this alone is quite odd as the temperatue within Drakelow is at a constant 10Â°C / 50Â°F. In some instances visitors have also felt as if they have been pushed. 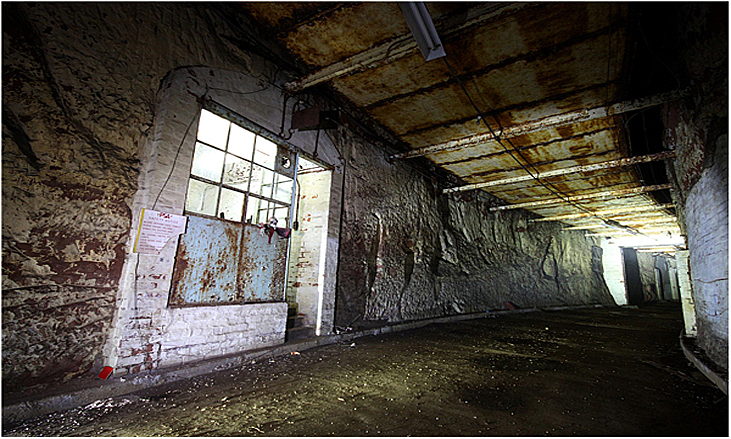 Most unexplained occurences happen in Tunnel 4 and Tunnel 1, deep inside the Rover Shadow Factory. The music is sporadic, but the mist is only ever seen in the winter months. Since 2000, Drakelow Tunnels has been investigated by many paranormal reseachers, investigators and even spiritualist mediums, in an attempt to uncover what is causing the unexplainable and in some intances quite unnerving occurences, that seem to be centered around Tunnel 1 and 4. On the 8th-10th May 2014, Drakelow was visited by Living TV's paranormal investigators Most Haunted, where they conducted and investigation into the unexplained happenings within the tunnels. The crew, led by Yvette Fielding were sealed off from the outside world and locked in the complex at their own request for 48 hours, their first night was spent in the old Rover Shadow Factory focusing on Tunnel 1, their second night was spent in the RGHQ Nuclear Bunker. When they emerged from the tunnels 48 hours later they were extremely distressed, what they heard and witnessed down there they could not explain? Watch the full episode below. Most Haunted at Drakelow Tunnels May 8th - 10th 2014. Drakelow Tunnels DO NOT organise Paranormal Tours of the complex.